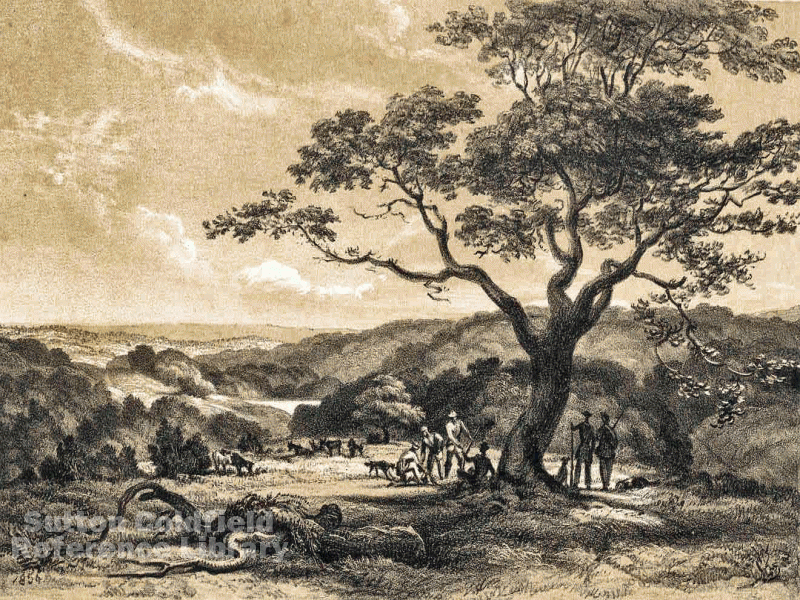 Sutton Coldfield was still a rural place in 1800 with a population of 2,800. This was almost double the estimated figure for the year 1700, but not enough to change the rural character of the town - the population of the nearby industrial towns was growing much faster. In 1800 the affairs of Sutton Corporation were being reviewed by the Court of Chancery because of a complaint that the needs of the inhabitants for education and other services were not being met. The Court also heard evidence that the Park Keeper of Sutton Park was not paid enough to enable him to devote all his time to his park-keeping duties, that the Park was attracting increasing numbers of visitors from the neighbouring towns, and that disorderly behaviour in the park was getting out of hand. The Court agreed that the Keeper’s salary should be increased so that he would be a full-time keeper, and that he should have two Assistant Keepers. The Chancery case ended in 1824 with an agreed programme of improvements for the Corporation to implement. In 1825 the annual wages of John Swift the Keeper of Sutton Park were increased from £24 to £60. Thompson and Nash, the Sergeants at Mace, were appointed to be assistant park keepers with an increase in annual wages from £6 to £50 each. John Swift already lived rent free in the park-keepers house just outside Four Oaks Gate, but the Chancery order provided for two cottages be built in the Park for the two assistants at a cost of £258. These cottages were completed in 1828; Nash moved in to Rowton’s Cottage and Thompson had Hollyhurst Cottage. At the Warden and Society meeting of May 13 1833 it was agreed “that some mode for the establishing a police for the better Government of the Town united with the Sergeants at Mace” was needed, and that “Two labourers at ten shillings a week be appointed to work for the Park Keeper and live in the Park Cottages”. The meeting of September 9 1833 heard that George Beech and James Pickerill had been appointed, Pickerill to have Rowton’s and Beech to have Hollyhurst cottage. The 1843 accounts show that Pickerill and Beech were in receipt of £60 wages as Sergeants at Mace/Assistant Keepers, and a third assistant, John Thursfield, was also employed. All three are named in the 1851 census as assistant park keepers living in Sutton Park, Thursfield’s address being Park Lodge, presumably the newly built lodge at Banners Gate. Seventy-year-old John Swift was still the head keeper. These four were the only peace-keepers employed by the corporation in 1843, but Mr Willoughby, a wealthy gentleman living in the large house in High Street which is now the Royal Hotel, was being given money “for police wages”, so may have been acting in a semi-official capacity using volunteers.